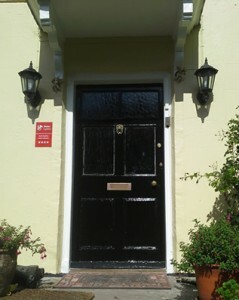 Welcome to Inglewood House, Country House Bed and Breakfast. Inglewood House is situated in Redbrook in the glorious Wye Valley on the border of England and Wales and is right on Offas Dyke. The river Wye is directly across the road and the Royal Forest of Dean rises from the back of the garden. Monmouth is two miles away and Tintern is seven. A bus stops outside the house taking travellers to Monmouth in one direction and to Chepstow in the other passing through Tintern en-route. Ross on Wye, Symonds Yat, Hereford, Ledbury, Ludlow, Abergavenny, Brecon, Gloucester, Hay on Wye, Bristol and Cardiff are all an easy day out from here. For walkers Offas Dyke runs along the back of the house and the Wye Way walk is to the front. There are many other walks from the doorstep. From Redbrook the route down through Llandogo and Tintern passes through some of the most spectacular scenery found in the Wye Valley. There are a number of outdoor activities on offer in the area such as Golf, Canoeing, fly and river fishing, walking, road cycling, mountain biking, horse racing at Chepstow etc. Nearby is Clearwell Castle and caves, Goodrich Castle, Butterfly Zoo, Hedge puzzles and mazes etc. An historic house Inglewood is old and quirky with a wealth of interesting features. We have open fires in the bedrooms, a circular staircase, portcullis gates and a non opening doorway halfway up the staircase. Two bedrooms have Hessian or leather panelled walls for hanging wallpaper. The main part of the house dates 1738 with the oldest part being much older possibly prior to 1650. Unfortunately the design and age of the house renders it unsuitable for wheelchair access because of the number and style of steps and stairs. Inglewood House offers three spacious bedrooms two of which have their own ensuite bathrooms and the third has it’s own private bathroom. Bed linen is white Egyptian cotton and bathrobes are provided in all rooms. There are electric blankets on all beds and hot water bottles on request. Bath towels are soft white and fluffy. Toiletries are of luxury hotel grade. All rooms have a flat screen television with remote controls and dvd players with a selection of films. An Ipod player/charger is available in all rooms. There is free access to wifi throughout the house. Please be aware that it can be difficult to pick up a mobile telephone signal although we do have an EE booster. Tea and coffee making facilities are available with home made cakes time permitting. There is guest seating area in the entrance hall and on the first floor. 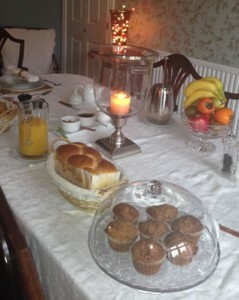 Breakfasts are served in the dining room from 8.30 to 10.00 am where the wood burner will be lit on cooler mornings. From September to May breakfasts are cooked on the aga providing the dry cooked aga free range eggs sourced from a local small holding. A variety of cereals, fresh fruits, compote, breakfast breads, home made muffins, croissants will be on offer in addition to traditional cooked breakfasts cooked to order. Whenever possible ingredients will be locally sourced and ethically produced. We work hard to make your stay with us as enjoyable as possible. You can be sure of a good night’s sleep as all of our mattresses are pocket sprung and when it’s cold outside you can be sure of a warm welcome. We have full central heating and for a small extra charge will light a fire in your room. If you’re heading out for a day walking or fishing we are happy to supply a delicious packed lunch. We have links with local fly fishing and river fishing and we offer storage for your fishing gear. We also offer storage for your canoes if you are planning to paddle your way down the River Wye. We also have links with a local beauty therapist, making a range of massage and beauty therapy treatments available in your room. On cold days the fire in your room will be lit on request for an extra cost. We are open all year round and offer off-street parking.